Blogging has become popular over the last few years. One can find a blog associated with almost every major company, small business, and organization on the Internet. However, attaching a blog section to your website is so much more than creating a presence on the Internet. It can help build your brand and boost your business. Here are just a few ways that blogging can make a real impact on your business. 1. BLOGGING BUILDS TRUST AND TRUST BUILDS INVESTMENT. In the world we live in, trust can be difficult to find. That’s where blogging comes in to the picture. It helps build a connection by creating targeted information and educating potential customers. Let’s say you are a customer who is about to make a huge purchase on the boat of your dreams. You start doing your research online. Which dealer do you buy from? The one with the website with only business hours and contact information or the one you just spent hours reading blog after blog about your new toy. The answer is simple. Blogs help answer questions and build trust; therefore, they help customers feel more comfortable in building a business relationship and investing in the future. 2. BLOGGING IS LIKE A MAP LEADING DIRECTLY TO YOUR WEBSITE. The Internet is like a wild jungle and when you are looking for a product or an answer to a question, it’s like being on a treasure hunt. Blogs give potential customers endless opportunities to find you. The more blog posts you have also means more opportunities to be found. If you write 100 new blog posts, then you now have 100 new opportunities to be discovered. 3. GOOD TRAFFIC TRANSFERS TO GOOD LEADS. All traffic created by blogging has the potential to send you valuable leads. When you blog about dog grooming, you are pulling in a targeted audience tailored to what you are offering. These customers want what you have. All you have to do now is provide a call-to-action such as a free checklist or free e-book on the same page as the blog. The reader fills out a form with their name and email address. BOOM! You now have a lead that will very likely turn into a customer. 4. BLOGGING IS THE GIFT THAT KEEPS ON GIVING. Even though you require sleep, the Internet is still going strong and so is your blog. Days, even years, after your blog is put out there, you are still generating traffic and leads. More traffic and targeted leads send more customers your way and help boost your business. Blogging is all about content, and content is king when building a web presence. Search engines, such as Google, use many different factors when indexing your website and determining how high or low to rank your site against other sites. Regular, fresh content on your website, such as an updated blog, helps you maintain your placement within a search engine and can even grow your placement over time. VisionAmp is an expert in blogging and can help you get the attention you want in order to reach your goals and overall boost your business. 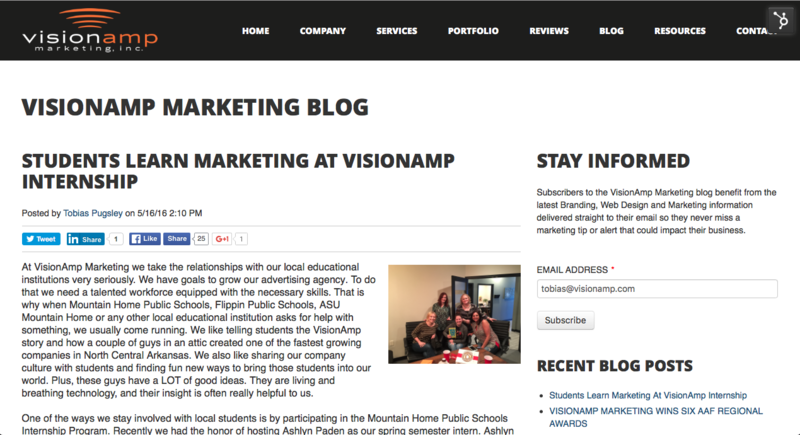 For more information on how VisionAmp can assist you in creating content for your blog, visit www.visionamp.com. You can also subscribe to our blog at blog.visionamp.com and never miss the latest tips on branding, web design, and marketing.